SMARTY Trend head device overview for BMW X-5. BMW X-5 car needs no introduction. It is very popular, thanks to high-quality assembly. A real car enthusiast will always find an opportunity to improve his car. In the case of the BMW brand is not cheap. Same work can do only official resseler, their cost automatically becomes unnecessarily high. 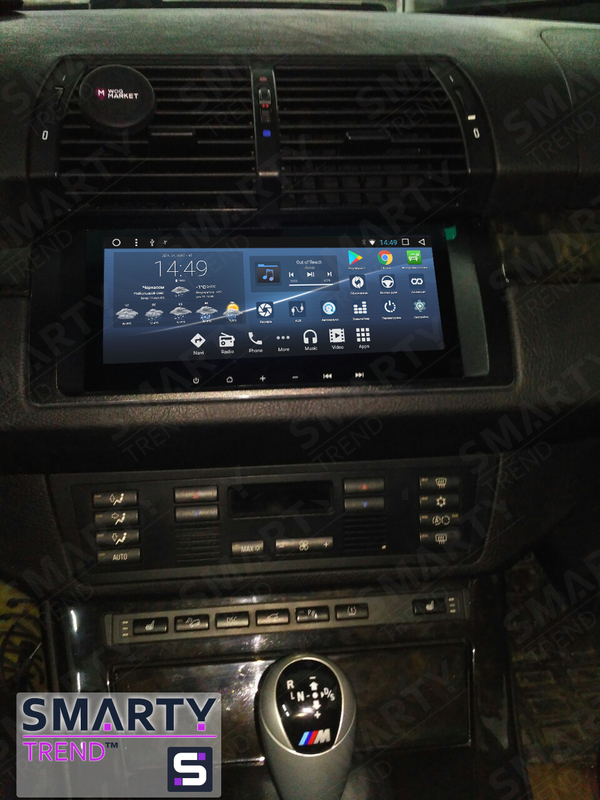 The company SMARTY Trend are ready to help you in solving problems with the head unit. Let's look at all the details. The main feature of this model is the BMW X-5, produced in 2004 in the E53. What particular features are we talking about? All other components of the head unit are in the trunk. Thus it is necessary to lay a new wiring through the entire vehicle. By the principle of plug and play. SMARTY Trend is not inferior to the origional. Receivers SMARTY Trend provide full support for all the standard features of your car. Thus, the device is fully integrated with the standard car system. A special feature is the design of the Android operating system. Thus, only the standard system of the car is fully supported. The availability of high-quality Internet in the car is a priority for many people. There are several options so you can connect your mobile phone. SMARTY Trend recommend to have you’re a loock to a Wi-Fi modem that works through a USB connection. This way you can connect to the network so you don’t miss anything important. A huge amount of new functionality has become available after installing SMARTY Trend head unit. Full integration with the standard system and support for all standard functions. As can be seen from the picture installed in a regular place, there are no gaps, excellent viewing angles, an 8.8-inch screen, and an HD resolution. The build quality and materials that are used surpasses the head unit. Ask to the professionals, we select the perfect head unit for your car.